We aren’t feeling as stuck as we were a couple weeks ago, but we do feel like we’ve made progress both forwards and backwards. We’ve been talking to some concrete contractors. One of them has been really helpful. He offered to bid on our piers, and quoted us a number far below the helical piers. That was great news! However, when he looked at the plans we had engineered, he discovered that they are very much overengineered for what we need. He said that if he built the foundation as it is in the blueprints, it would cost over $35,000 and he would not be able to do the work because of the specialized equipment necessary. $35,000 is WAY TOO MUCH for a shop foundation, by the way!!! The contractor then told us about certain elements of the design that are, in his very experienced estimation, completely unnecessary, and advised us to get a second opinion on the engineering. He couldn’t rewrite the plans because he’s not a licensed engineer. We are going to do that; first we have to have the second firm come drill a soil sample, and then they will have a look at our plans. That’ll take a couple weeks. And while these conversations are all happening, our Excursion broke down. We knew it was having some trouble, and we were very glad it chose to break down in town five minutes from a Ford dealership with a diesel mechanic on staff! Just the day before we’d been using the truck at the farm, and it would have been much harder to get it towed from the farm! The diagnosis was that two of the eight fuel injectors had gotten stuck open. Plus the high pressure oil pump was all but shot. This was very expensive, and because it’s our farm vehicle, we had to use farm money to fix it. Which means we don’t have the money to build our foundation/plumbing/septic system any more. And then I was crying all over again! Surely someone in this wide world of ours has some pithy quote about making plans only to have them change constantly. The past couple months have been a period of intense work for Andrew and lots of waiting for me. He’s had a ton of work for our IT company, and hasn’t had much time or brainpower to direct to the farm projects. Now, however, we are emerging from that phase ready to tackle the next projects on the farm. We have four things we need to accomplish in order to move our fifth wheel out. We’ve learned a LOT! Today, for instance, we learned that we thought we could build the septic system and then tie the barn plumbing into it. But it should be done the other way around; the plumbing for the barn and RV should be at least roughly in place before the septic goes in so that the flow goes properly. We decided to hire a septic company to do the septic system. We thought we could do it ourselves, but we just don’t know all we need to know about dirt and effluent and plumbing. Plus, Andrew’s time is far more valuable to us when he’s applying it to his business. This week we intended to get the dirt work started. Instead we got 2+ inches of rain. Next week looks much drier, though, and we are excited about tearing up some dirt in order to get the gravel put in place! Last Friday was such an exciting day! It was the day that the pieces for our steel building were coming, so we rented a forklift and hired a driver to help us move the containers onto their piers on the same day. Here they are prior to moving. The one on the left is my MIL’s (it went on the piers); the one in the middle is our current storage container; and the one on the right is the 20′ short container that Andrew converted into his office a couple years ago. Our container that went on the piers was behind this arrangement. We will be moving our stuff out of the orange container into the building and selling the orange one soon. Here is the first one on the move. The cows next door were fascinated (I realized later it was because the truck that pulled the forklift out to the property looks like their feed truck). After a bit of finagling with the southwest corner, the first container was up on its foundation and all four corners locked in place. As we were moving the second container, the truck with the barn showed up! The forklift did a great job unloading the truck. The building company told us to estimate 4 hours for unloading and it was done in less than two. And then we hit a snag. The forklift was too short to lift the final container up by about a foot! The driver tried piloting the container in from the north side of the building since it is closer to the ground. The second story container HAS to go on the south end, though, since that’s where Andrew had our welding guy weld extra supports. Right after I took this picture the forklift got stuck in mud. I couldn’t watch anymore. I went down to my zen place – the garden – and covered the entire second bed with my nice dirt. I never doubted that Andrew could pull it off…I just didn’t want to watch it all happen. And there he is! He did it! The top container is currently bolted down to the bottom two, plus it’s held on with chains. As soon as our welder can come back out, he will weld the top container to the bottom containers on all four corners and then construction will be done! We had curious onlookers stop by and ask what was going on. That was funny. Also, the bottom container’s corner is painted with the proper colors. The white is the primer; the containers will eventually (hopefully soon) be painted the field green color with the chocolate brown trim. It will definitely be less of a sore thumb then. Our first building! It’s done! Ready for our first building! Yesterday we completed preparations for our container building! Next Friday the pieces for our steel building barn are scheduled to be delivered, and the forklift we need to get the pieces off the truck is the same tool that can be used to move the containers onto their foundation. In order to kill two birds with one stone, we’re doing both on the same day! So we had to make sure the foundation was totally ready for the containers. First, though, I just gotta tell you I was super excited. I went to bury this week’s food scraps and plant seeds on top. This time I dug up a small part of the garden bed near the girls’ playhouse. Guess what I found? EARTHWORMS! This is terrific! 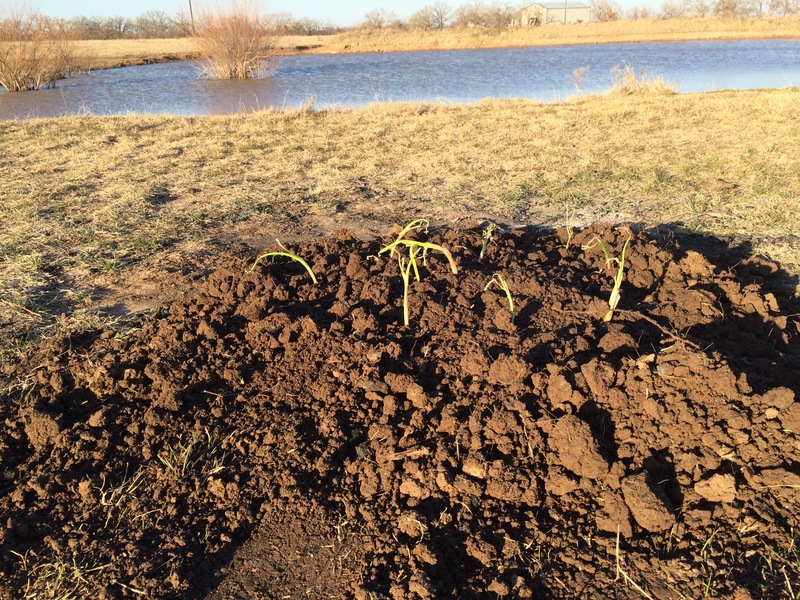 Earthworms in the soil are an indication of soil health, and this means our soil is not as bad as I feared! Can’t wait to see those flower seeds sprout and grow. Most of the day was spent installing concrete around the helical piers. We used these round forms, buried about a foot deep, and poured concrete all the way to the top of the pier. We mixed all the bags by hand (and by “we” I mean “Andrew”). Ellie wanted to help, so she got to help measure the water added to each load! Poor kid; just after I handed my MIL the phone to get a picture of family concrete mixing I accidentally sprayed her in the head. She was a good sport about it but I still felt terrible!! This is what it looked like when we were done! Because of the shape of the pier I got to get a 32 oz plastic cup and painstakingly pour cup after cup after cup in carefully between the form and the cap on the pier. My shoulder is super sore today after hundreds of repetitions with a 5 lb weight! Andrew is super sore too; he hauled all that concrete and mixed 14 80-lb bags himself. Farm work is hard but so rewarding! This was our reward! Pancakes cooked over a campfire! My MIL brought them for dinner and man, if I could eat fresh pancakes every time we are at the farm I would be super happy! 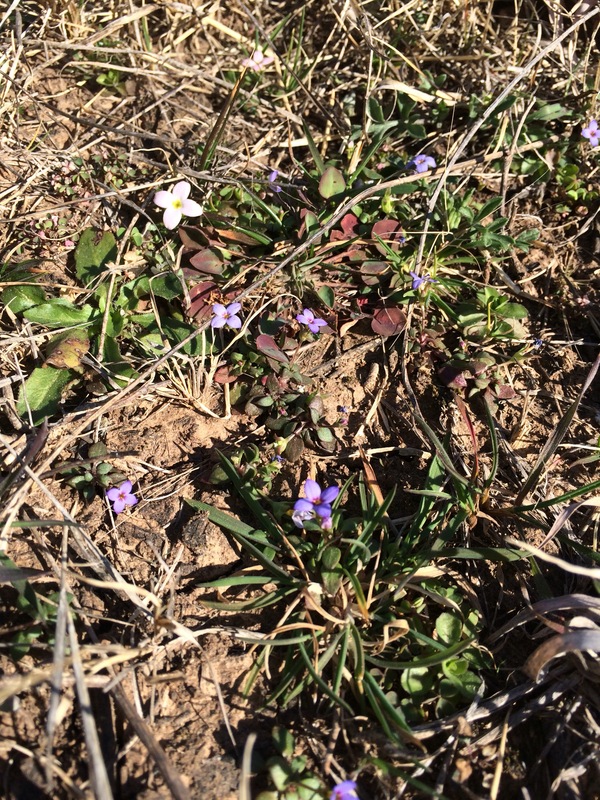 At the farm yesterday, we spotted the first signs of spring!! I have no idea what those little flowers are. I really need a book on Texas wildflowers and native grasses. If you have a book you like, please send along the recommendation! And I planted my first small plants in the hugelkultur bed! 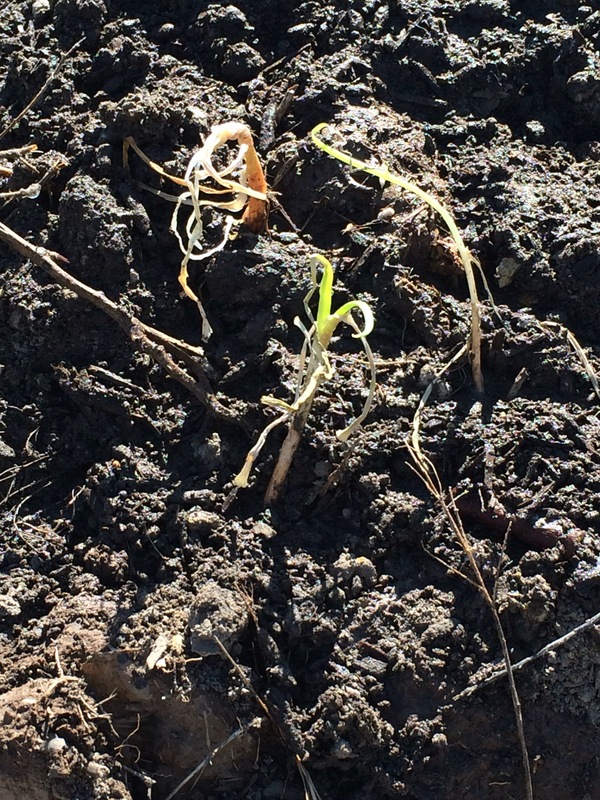 These are onion starts – I bought a bundle of 25 or so at a local feed store and split them between my RV park garden, the hugelkultur bed, and a new idea. I’ve been having a problem that I think I solved yesterday. Let me explain. I have been saving food scraps to compost. Since we live in an RV park it’s not practical or neighborly to start a compost heap here. I have a composting bin at my MIL’s house, but it’s not really animal proof. I thought putting the food scraps in the hugelkultur beds would help with their fertility, but it just attracted animals that dug up the newly placed soil to get the apple cores and banana peels. So there was my problem; I didn’t want to throw away food scraps that could be used for improving our awful soil but I didn’t want to encourage wild animals to help themselves to everything in my garden. At the farm conference last week, a couple ideas stuck in my head, and together they brewed up a solution to my problem. 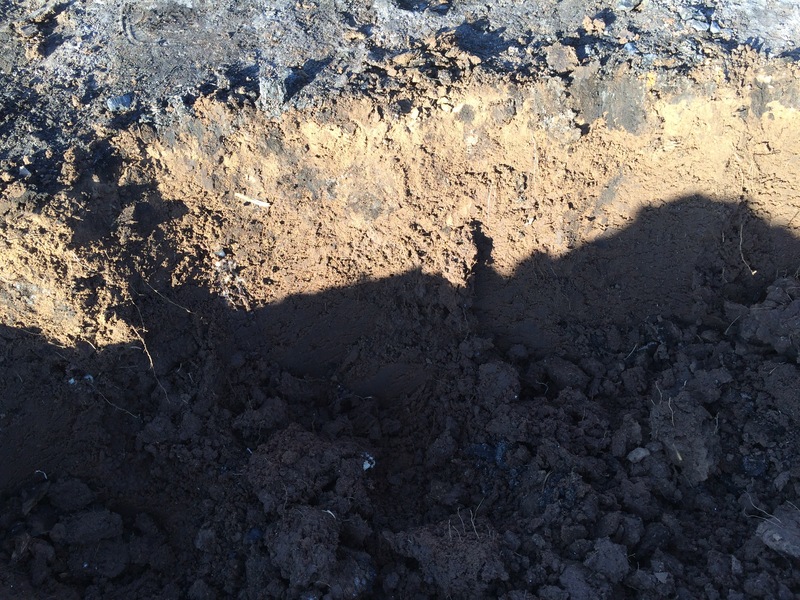 First, any bare soil on your farm needs to be addressed. 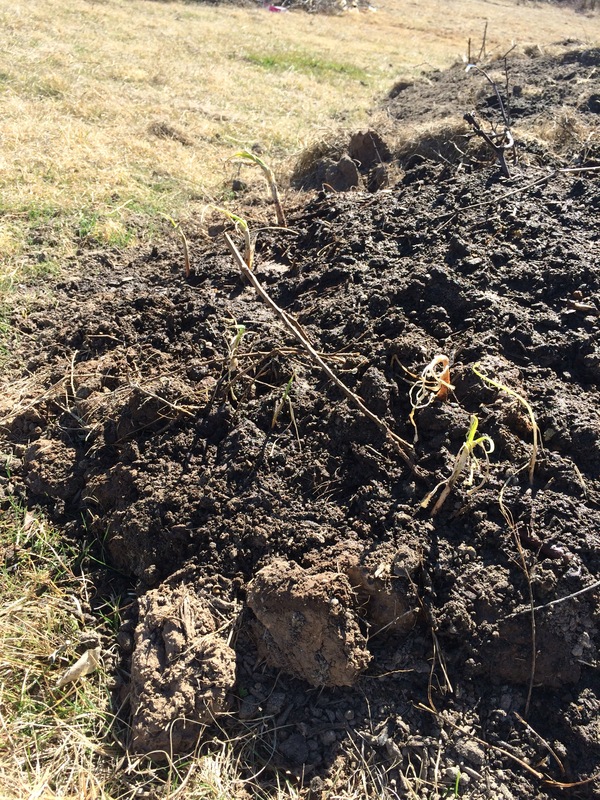 Bare soil won’t soak up rain or sink carbon, and just isn’t producing anything at all, much less anything valuable. Second, the goal of everything you do on your farm should be to 1) make money and 2) increase the fertility of the earth. With those ideas in mind, I came up with a plan. I found the worst patch of dirt on the farm. It was where we had a couple bonfires before we put the fire ring in place. The soil was bare and scorched. It wouldn’t absorb more than about a quart of water. And when I dug it up, there was ZERO insect life in the soil. It was dead, dead, dead. 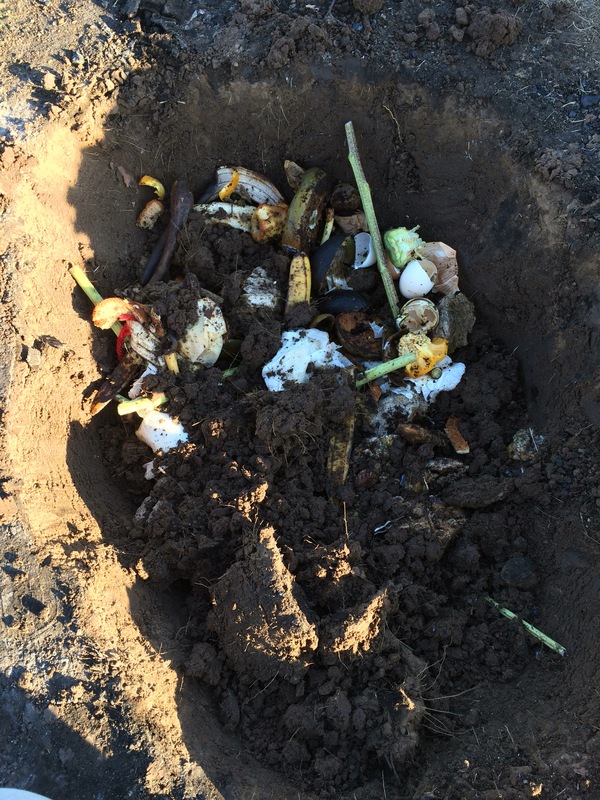 I dug six inches down and dumped a week’s worth of compostable food scraps in. Banana peels, egg shells, old bread, etc. Then I filled it back in, taking care to crumble the very dense clay into smaller clods. And I put the rest of my onion starts in the soil on top. I think the view alone will encourage them to grow nicely! I’m really excited about this idea. It solves many problems all at once. The next few months I’m going to concentrate on planting patches of wildflowers all around the farm to attract bees and butterflies. In other news, Andrew got paint samples and my mother in law did a corner of one of the containers for the building. Oh my gosh, I love it! The main greenish color blends in beautifully with the landscape, and the brown trim sets it off so nicely. It’s going to look so…RIGHT. Yesterday was WINDY. 20-30 mph constantly, all day. It wasn’t too fun, but hey. It’s our farm. I’ve not had a bad day there yet, windy or not. Next week: we pour concrete to finish the foundation for the container building! January 28, 2016 was a great day – 65*, sunny, and best of all, the day we broke ground on the shipping container building! This is the first building being built on the farm. We were so excited to see it really happening! We hired RamJack Systems to drill our piers and had a great experience. They sent a crew of five men and a Bobcat with a hydraulic drill attached to drill our 8 piers. This is at the start of the drilling process. This is the completed job. In addition to drilling the piers, they busted out their super cool level to cut the piers to level and installed caps. In the foreground you see the two piers with square caps are under a foot off the ground. 40 feet to the south and they are over 2.5 feet tall. I didn’t realize the foundation was on that much of a slope. We are grateful they did the leveling for us! The next step is to have someone come out and weld the container anchors on the pier caps. Then, on the same day the steel barn is delivered, Andrew is going to move the containers from their current resting spots to their home on the piers. Why on the same day? Because we have to rent the biggest forklift you can rent without needing crane certification in order to move the steel building pieces off the truck. So Andrew figured he’d kill two birds with one stone and move the containers at the same time. We also will dig out about 2′ around the piers and pour concrete to resist lateral wind shear. Each pier would require 60,000 lbs of upward pressure to move and we have 8 of them supporting the building. This is going to be a great storm shelter. Another project we worked on was cutting and burning these nasty little locust trees we have growing all over the fields. These thorns are something else. So glad I was wearing my boots!